What's In A Grid Square? 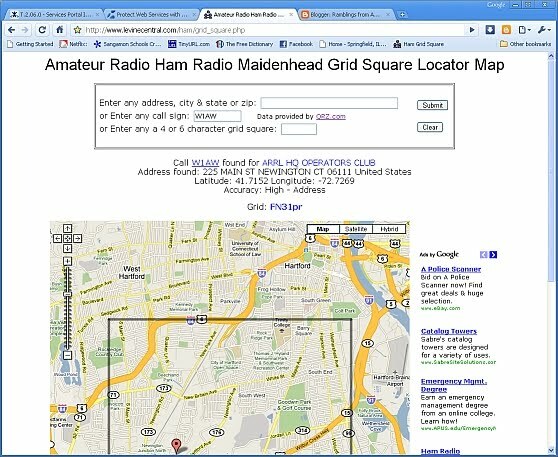 A lot of times you'll hear references to "grid squares" or more specifically "Maidenhead Grid Squares". 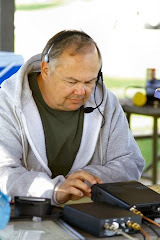 You see 'em on QRZ.com, read about them in contest reports, and see where some contests especially for ATV, VHF, or UHF use them instead of States or Counties. 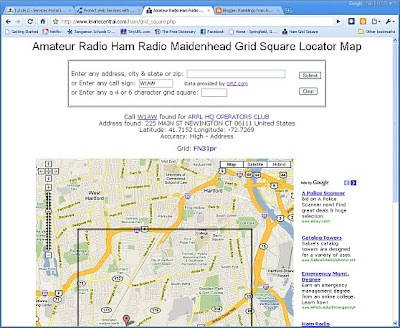 Whether you're into VHF/UHF contesting or are just curious where your local hams are at these resources provide some interesting information in an easy to use format. It's Lincoln Trail Hike Time! Next week, Saturday April 24th is the 2010 Boy Scouts of America Lincoln Trail Hike. 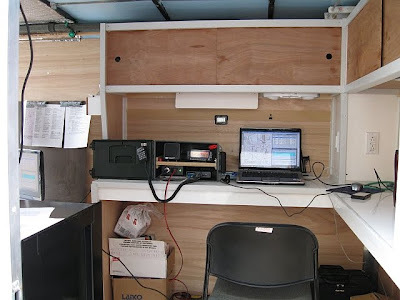 Each year Central Illinois Hams provide phone and APRS support. The screen capture below is from http://aprs.fi. 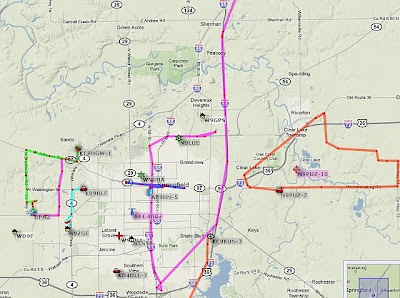 You can see myself and Bob KC9HGW (EPA2) testing out trackers and radios in the Springfield, IL area. Last weekend my wife Teri K9TLM and I went to Branson, MO to attend our first ever Ozarkcon put on by the 4 State QRP Group. It was fantastic as was the weather. Saturday included several informative seminars. 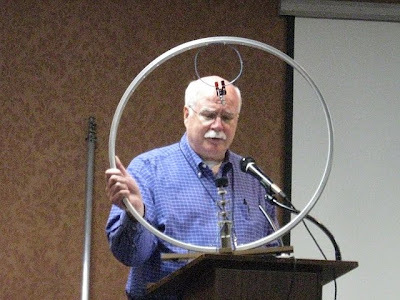 In this photo Dave Gauding NF0R describes a small loop he built from a bicycle rim. 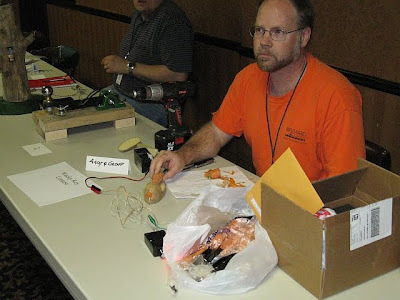 Ozarkcon also featured several opportunities for kit building. 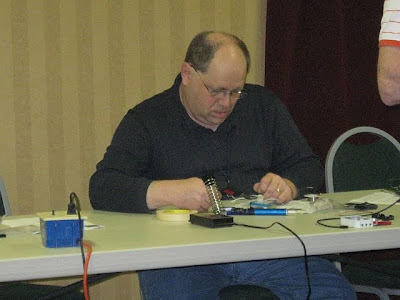 Here, Paul N9PCS works on a keyer. Creativity was unbounded. This building entry in the "Whacky Key" category featured a key carved from a potato and a carrot. Vegatarian CW anyone? Of course there was serious work at Ozarkcon too. 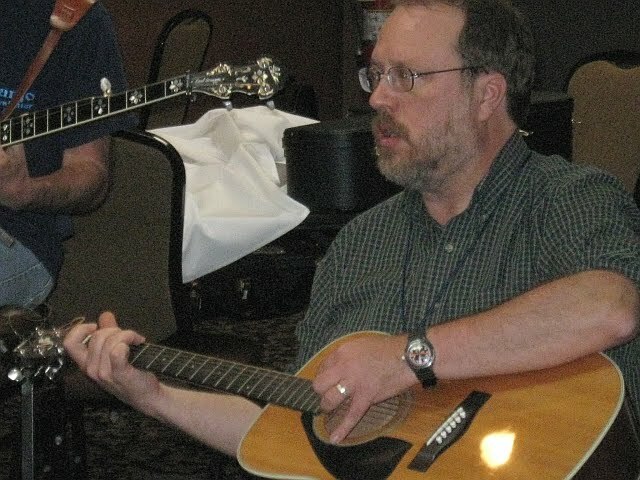 Here, Dave NM0S plays along with the nightly Bluegrass concert. Musicians came from Ozarkcon attendees as well as locals who just dropped in to jam. All in all this is a laid back, highly recommended event. Schedules permitting I plan to go back in 2011. Hope to see you there! This year members of the Sangamon Valley Radio Club and Springfield's Community Emergency Response Team - C.E.R.T joined forces to support the Springfield Road Runners 1/2 Marathon. There were 1,050 runners from around the Midwest that participated under cloudy skies and fortunately just a few minutes of rain. 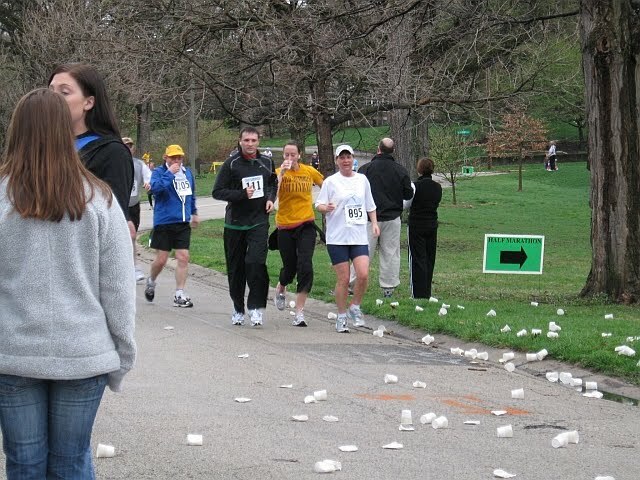 In this photo a group of runners goes through a water stop in Washington Park. We utilized the local K9CZ 440.400 MHz UHF repeater as well as APRS to keep in touch with radio operators around the course. A UI-View APRS station was used to track medical vehicles and two pace vehicles. One was at the front ahead of the first runners, a second followed behind the last runners. 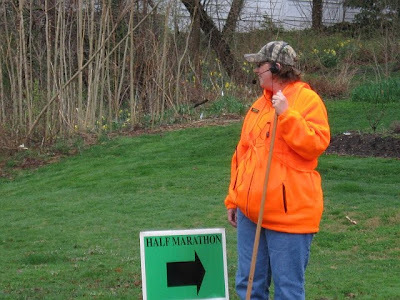 This allowed race officials to observe the race as it progressed in addition to listening to voice communications. You can see an UI-View APRS display and a VHF/UHF "go kit:" with radios, power supply, etc. 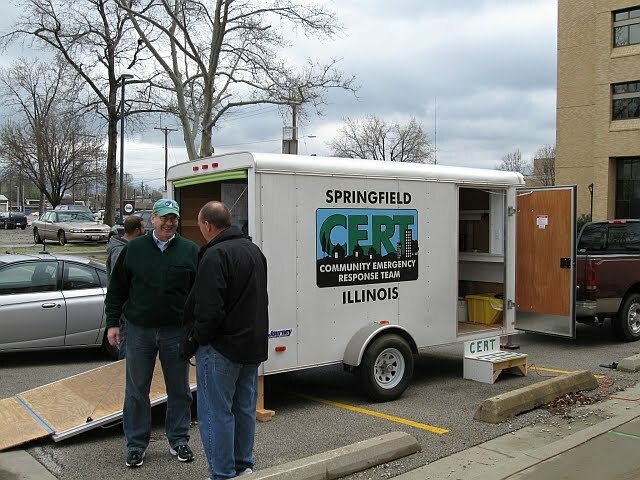 The trailer was provided by C.E.R.T. which is sponsored by the City of Springfield Fire Department. The lead vehicle in the marathon was an Illinois State Police cruiser. 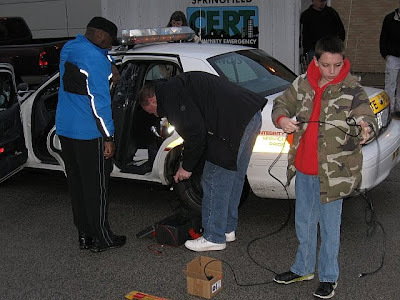 Steve K9WAV and his son Ben KC9KNL are installing an APRS tracker system in the squad car at around 6:30AM. SVRC volunteers were everywhere. Here Claudia N9HHE watches as a group of runners approaches the intersection she was watching. Of course no matter how smoothly an event comes off there is always room for improvement. Here Bob KC9HGW and Steve K9WAV discuss the event and brain storm ways to improve support for 2011. People express themselves using a language that has many words. Computers use a simple language that consists of only 1s and 0s, with a 1 meaning "on" and a 0 meaning "off." Trying to talk to a computer in its own language would be like trying to talk to your friends by using Morse code—it can be done, but why would you? Unbelievable! I plan to send Microsoft a note about this. Surely if those people on TV who say "make my computer so it doesn't crash" can get an entire new version of Windows created just for them Microsoft will move quickly to correct this horrible statement.